How Can Product Managers Make The World Ready For The Return Of Crystal Pepsi? How will Pepsi product managers make people want Crystal Pepsi? So when we start to talk about “old school” and colas, just exactly what are we talking about? The product managers at Pepsi seem to like to dip into the past when they run into product problems in the present. Case in point is their recent launch of a cola called the “1893 Original Cola”. This cola was designed to capture the nostalgia from the year that Pepsi first started to be sold as a cola. Additionally, they have introduced a new cola called “Caleb’s Kola”. This cola differs from other colas in that it is made with cane sugar instead of high-fructose corn-syrup. Nope, that has not been enough for the Pepsi product managers. In part because over the last year they have seen sales of their cola products fall by 2%. This is in marked contrast to the rest of the cola market that has seen a decrease of only 0.6%. Its fall off in sales may have been due in part to a disastrous decision by the Pepsi product managers to replace the aspartame sweetener in their Diet Pepsi product with a sucralose-sweetened version. Customers pushed back – existing customers didn’t like the new taste and the switch did not draw in many new customers. So what’s a Pepsi product manager to do? Well they’ve decided to travel back in time to the 1990’s. What they are now planning on doing is reintroducing a product that they first rolled out in 1992: Crystal Pepsi. This product, unlike their flagship Pepsi product, is a colorless soda. Way back in the 1990, for a brief point in time there was a fad where clear sodas become popular and everyone raced to update their product manager resume. What Is Pepsi’s Plan For Crystal Pepsi? Clearly Pepsi is hoping that by reintroducing Crystal Pepsi they can cause their decreasing soda sales to have a temporary boost. When they originally introduced Crystal Pepsi back in the early 90’s, they made a lot of noise about it. However, it quickly fizzled out. The same fate hit all of the other clear beverage products that were introduced at the same time. The original trend towards clear cola beverages started in 1992 and was largely over and done with by 1994. Originally when they introduced Crystal Pepsi, Pepsi had hoped that the brand would eventually grow to become a US$1B brand. This never happened. At its height, Crystal Pepsi only accounted for 0.5% of Pepsi’s sales in 1993. Pepsi’s goals for Crystal Pepsi had been for the brand to account for 2% of their sales. Pretty much all of the sales of Crystal Pepsi had gone away by 1995. The reason that Crystal Pepsi never caught on was because many drinkers said that it did not taste enough like regular Pepsi. The Pepsi product managers are trying to develop excitement for the reintroduction by holding sweepstakes. They claim that there was “overwhelming fan demand” for bringing back Crystal Pepsi. The product managers at Pepsi are facing a problem. More and more of us are choosing to drink less of their flagship product: soda. Instead we are drinking water and other drinks. What they need to do is to take a look at their product manager job description and find a way to once again get us interested in drinking soda. They have decided that in order to get us to drink more soda, they need to introduce more varieties of soda. They have created new sodas with different sweeteners and different formulas and they have undone a poorly planned change to how they sweeten their Diet Pepsi product. 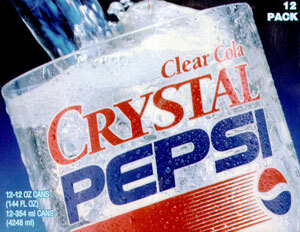 What the product managers are now planning on doing is bringing back a product from the early 90s: Crystal Pepsi. This product had been introduced with great fanfare, but then faded in a couple of years. This time around they are trying to generate more excitement for the reintroduction by holding sweepstakes. Question For You: How long do you think that the Pepsi product managers can sell the new version of Crystal Pepsi? I think that we do need to hand it to the Pepsi product managers – at least on paper they did everything that they really should have done. They conducted countless taste tests and tinkered with their Diet Pepsi product development definition all in a quest to give their customers what they wanted. However, in the end it turns out that they got it wrong – they completely misread their customers. Can they repair the damage that they’ve done?